An update from Rights Action (rightsaction.org), issued on May 24, reports that on the evening of May 22 the armed forces opened fire from their posts on the Paso Aguán plantation “in what appears to be attempts to intimidate and scare the community of ‘La Panamá’ that lives inside and adjacent to the finca.” Although no current members of La Panamá’s community were killed or wounded in this raid, the attack appears to be part of a pattern of human rights abuses committed by the Honduran security forces and the Dinant Corporation’s security guards. At this point the members of the La Panamá community are almost certainly being wrongfully targeted by key state and corporate figures and are being deprived of their rights to their land. Miguel Facussé, owner of the Paso Aguán plantation and one of the largest landowners in Honduras, has “accumulated land through coercive and fraudulent land purchases” since 1995. La Panamá formerly owned a fraction of the Paso Aguán plantation and the African palm growing on the plantation was originally planted by the community during the 1970s and 80s agrarian reform initiatives.Today the livelihood of campesinos is in jeopardy as their labor has been reduced to subsistence agriculture. Over the past nine months, the community of La Panamá has managed to occupy a small fraction of land from the Paso Aguán plantation. The formation of the Campesino Movement for Refoundation – Gregorio Chávez (MCRGC) is largely responsible for this small victory. The MCRGC is a coalition of farmers that came together in response to the July 6, 2012 exhumation of the cadaver of community leader, Gregorio Chávez, which was discovered on the Paso Aguán plantation. Since the military coup of 2009, over 100 campesinos have been murdered, but this statistic does not account for disappeared persons. Nevertheless, the Chávez murder moved campesinos and international organizations to redouble their search for the whereabouts of disappeared community members. The discovery that Facussé’s confederate had used the plantation as a dumping ground for Chávez raised the likelihood of finding other clandestine graves on the plantation. 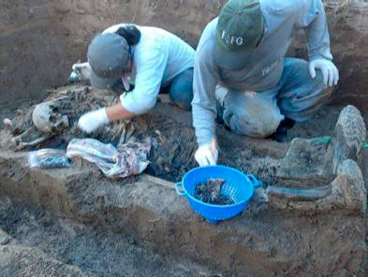 On April 25, a Guatemalan archaeologist and forensic anthropologist of the Guatemalan Forensic Anthropology Foundation (FAFG) located a clandestine gravesite on Facussé’s plantation. The anthropologists discovered the body of José Antonio López Lara, who had disappeared a year earlier. Moreover, this find provided empirical evidence to prove that López had been tortured and murdered. His body was found to have been badly wounded, his right hand was not intact, and his skull bore significant signs of blunt force blows applied to the head. Eight days before his disappearance López went fishing in a nearby river. While on his way to the river, López was warned by Dinant security guards that if he was ever seen again fishing in the river that he would be killed. Unfortunately, the choice for López to return to the river was not a voluntary one as fishing is essential to the survival of the campesinos whose food sources have been greatly diminished since the illicit de facto acquisition of their farmland. After López disregarded the threat by the security guards on April 29, 2012, he disappeared. Despite international concern, the Honduran press, as well as both the Honduran and U.S. governments, continue to neglect their responsibility to act in the best interest of the campesinos. This is disputed land, to call them [campesinos] ‘squatters’ is to assert a bias on behalf of big landowners… We should be on the side of negotiation as formerly democratically elected President Manuel Zelaya was before the  coup. The State Department clearly ignores the landholding status of the La Panamá community and, in effect, legitimizes Miguel Facussé’s skewed empire of criminals by recognizing him as the area’s rightful landowner. There is no knowledge that there is armed resistance in any of the towns around the region and it is crucial to be clear about this fact because it has been used as an accusation against the campesinos. While assassinations and raids do not occur every day in the Bajo Aguán Valley, Grahame Russell said, “the threat of violence and murder is a daily affair.” For this reason, the campesinos have well-developed methods of surveillance and cell phone networks that are used for communicating between communities in times of urgency. Russell described the campesinos’s systems as “profoundly organized, profoundly networked.” Part of this network serves to notify members of the community when Dinant guards or soldiers are present so that the townspeople may disperse and avoid confrontation. Russell asserted that the campesinos, while non-violent, are committed to retaining and recovering the land to which they have a rightful claim. Despite the fact that there are presently cases regarding land disputes in the court system, at this time they have provided little hope for campesinos. Only once since the 2009 coup has a Honduran court justly ruled in favor of them. Additionally, after successfully representing the community of San Insidro, attorney Antonio Trejo was murdered in September of 2012. For its part, the legal system of Honduras offers no resolution as it is ridden with corruption. Instead, the campesinos have adopted alternative forms of affirming their rightful ownership to the land. By mobilizing official representative bodies or “movements,” the campesinos have been able to unify and strengthen their case against their oppressors– Miguel Facussé and the Honduran military. For example, “movements” such as the MCRGC have achieved limited success by occupying land. Other “movements” within the Bajo Aguán direct their efforts towards different aspects of the land dispute such as providing support for families of the disappeared persons and land recuperation. However, as the land dispute continues, it cannot be certain that the campesinos will not be forced to employ self-defense should the repression continue. 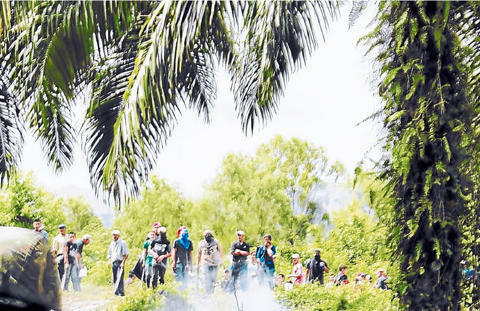 Following the events of May 22 there are reports that on Sunday, May 26 authorities apprehended seven campesinos of La Panamá without just cause. Additionally, outside of the Bajo Aguán Valley, at 7:15 AM on May 30, a man later identified as a Honduran policeman opened fire on the Trochez family while at their home in the city of La Cieba. The father and his youngest son were murdered and the mother was hospitalized for wounds. Trochez and his family had left the Bajo Aguán region in February of this year and were living in La Cieba to protect themselves after his oldest son was killed in August of 2012. The violence related to the land dispute of the Bajo Aguán has left the geographic span of the valley. Time is of the essence and despite the publicity that the land dispute has attracted, the security guards and Honduran military persist in abusing campesinos of the Bajo Aguán area. Though the campesino communities of the Bajo Aguán have proven to be incredibly resilient in their struggle against the big businesses, they need outside help. The United States ought to immediately suspend military and logistical aid to those Honduran security forces involved in the human rights abuses. This should send a clear message: stop the killing now. Also, the intellectual authors as well as the direct perpetrators of those abuses must be held accountable for their crimes before international tribunes. Similarly, during the epoch of the Banana Wars, which persisted through most of the twentieth century, Honduran officials cooperated with Carl Lindner’s Chiquita “Banana Staff” to buy off Honduran judges, police, and civil authorities to corrupt local officials at the cost of sacrificing the interests and rights of Honduran farmers. The campesino lifestyle and tradition are fundamental elements of Latin American culture, as witnessed in Honduras. Once again, the campesinos are not fighting for land per se, but rather for their basic livelihood and self-preservation. By disregarding the campesinos’s ownership of their farmland, Honduran executive and judicial branches are depriving them of their humanity. Around the world, campesinos must be identified as assets for development and be included in democratic governance. Spring, Karen. “More Repression Against ‘La Panama’ Community in Honduras: Urgent Action and Support Needed.” Rights Action. 24 May 2013. Accessed 24 May 2013. http://www.rightsaction.org/action-content/more-repression-against-%E2%80%98la-panama%E2%80%99-community-honduras-urgent-action-and-support. Honduran Office of State Department, interviewed by author, telephone interview, 24 May 2013. Grahame Russell, interviewed by author, telephone interview, 25 May 2013. Peace Corps Safety Measures: Making up for Past Mistakes?